"The University of North Dakota was famously known as the Fighting Sioux from 1930 until 2012, when the university retired the nickname. The school had been one of 18 institutions @ncaasports singled out in 2005 for having an American Indian mascot it deemed hostile or abusive. The university appealed, lost and chose to fight in court. The dispute dragged on until June 2012, when North Dakota voters overwhelmingly chose to phase out the nickname. But the #FightingSioux legacy is not going away quickly or quietly. 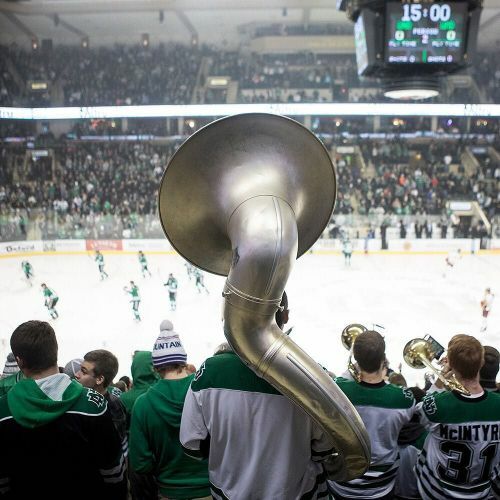 The photographer @timgruber took this photo of North Dakota fans at a recent men's hockey game against Minnesota-Duluth. More than half of the announced crowd of 11,890 wore Sioux-themed attire, and mentions of the Fighting Hawks, a new nickname chosen in an online vote last November, drew boos. #regram from @nytimessports" By nytimes on Instagram.